This is an update of an old twimii recipe and it’s surprisingly good. A lovely bittersweet bite of chocolate goodness – yeah that’s a thing. I hadn’t made this for years. I think 2012 was the last time I made it. If I bought dates I’d use them for the banana pear pie and that’s a little convoluted to make – particularly in comparison to making cakes that contain refined sugar or with my oh-so-simple guilt-free cakes. So I stopped making the banana pear pie and stopped buying dates. And I really didn’t remember what this tasted like and wasn’t expecting much – it’s actually lovely – not too sweet, just the right amount, and the prunes offer the right amount of tanginess. And I guess it’s quite healthy too. I’ve changed just a couple of things from the original. The biggest change is that before I suggested serving the cake with natural yoghurt with vanilla extract whipped in and now I’m using cream whipped up with natural whole yoghurt and vanilla bean paste, so it’s sweeter, more mellow and lighter in texture. It’s very nice. This is very filling, not in a heavy dense way just in the way that you definitely won’t be hungry after eating it. Maybe that’s because it’s got a lot of protein in it. Ingredients for a chocolate goodness cake. Add half the hot water to the cocoa powders and mix in well till smooth. Add 3.5 tablespoons of the yoghurt and all the dates into a blender. Add the smooth cocoa mix on top, use the rest of the water to get all the cocoa from the bowl or cup into the blender. Add a generous teaspoon of vanilla bean paste and blend for a minute or so until smooth. Separate the eggs placing the whites in a large clean glass bowl and the yolks into the blender. Blend one again. Next add in the ground almond, stirring them down into the mixture before blending again for about minute. The mixture should be quite smooth now. Whisk the egg whites till they form soft peaks. Add a couple of spatulas of the cocoa-cake mix to the egg whites and fold in. Do this until you have folded all the cocoa-cake mix into the egg whites. Add some chopped prunes into the mixture and fold in - repeat until everything is mixed in together. Pour the cake mixture into your lined cake tin and bake in the oven for 1 hour. Take out, turn out on a plate and allow to cool. Pour the cream into a deep bowl and spoon in 2.5 tablespoons of the yoghurt. Whisk until it starts to stiffen. Whisk in the teaspoon of vanilla bean paste. Taste and adjust by adding a little more yoghurt or vanilla as you see fit. Spread the whip over cake. 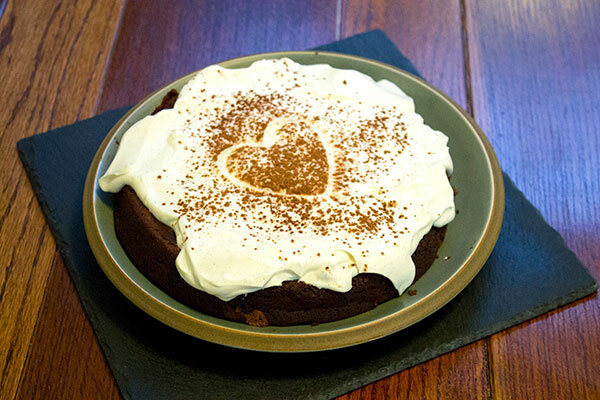 Sprinkle a little cocoa on top - the vanilla bean paste makes the topping look a little grainy and the cocoa distracts the eye from this without affecting the taste really Enjoy! The reason why I suggest chopping the dates before adding them to the blender is partly to ensure you'll discover any stones that might still be in them and partly because my blender isn't that strong so it saves the motor, same reason why I blend the cocoa with the water before adding. All the ingredients bar the egg whites and prunes are mixed till smooth in the blender. Fold the chocolate mix into to the egg whites. It’s a good idea to line the bottom of the tin with greased baking paper. I unfortunately didn’t line this tin. But slap some whipped vanilla-yoghurt-cream on top, sprinkle a little cocoa over it and sure who’d know?